Chrome has at least 5 different ways for you to copy the URL of a page you are visiting. One of the most evident, though, has always been very inconsistent: long press. For a long time, tapping and holding on the address bar would sometimes select the entire URL and sometimes just randomly select part of the URL where you tapped. However, that is no longer the case. We're not sure when it started - I was able to verify the behavior was there back in Chrome 62 stable, but it may have happened before that. Now when you long press on the address bar, Chrome will consistently select the entire URL and show the floating text selection menu options, letting you copy or share it immediately. Finally. For people like us (read: mostly Artem) who view hundreds of Chrome pages every day and need to copy and paste them in various applications, this consistency is a boon for productivity. Previously, we had to resort to sharing to "copy to clipboard," or tapping the info button or the HTTPS lock button then tapping and holding the URL to copy it. It might have only taken a fraction of a second longer, but those fractions added up over a day, a week, and then years of doing the same convoluted thing. 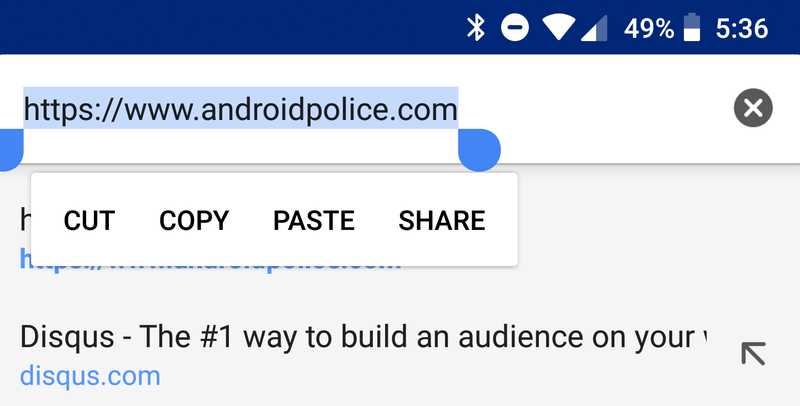 Again, this has been the case since at least Chrome v62, but we only just noticed it so we thought we'd let you know... just in case you copy and paste URLs for a living like some of us here at Android Police.